Journal of Materials Sciences & Technology is a monthly journal for the rapid dissemination of new, important results in material and related fields. Electronic files of MS Word and PDF are acceptable. 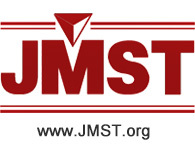 Please visit http://www.jmst.org and submit online. Submission of a manuscript must be the original work of the author(s) and has not been published elsewhere or under consideration for another publication, or a substantially similar form in any other language. Authors are encouraged to recommend three to five individuals (including their research fields, e-mail, phone numbers and addresses) who are qualified to serve as referees for their paper. All manuscripts should be written in English. Letters are generally no more than three journal pages. Research articles and review articles have no page limit. The supporting organization and the grant number should be given in the section 'ACKNOWLEDGEMENT(S)' of the manuscript. For more details of submission format, please visit our website: http://www.jmst.org. The title of the paper should be concise but informative. A list of all authors, as well as corresponding addresses, should be provided on the title page. Authors’ names should be given in a consistent form on all publications to facilitate indexing. It will be better if the technical titles, fax number(s), e-mail address(es), and telephone number(s) are all provided. The abstract should be no longer than 500 words. It should be informative, without descriptive words or citations, and contain the major conclusions and quantitative results or other significant items in the paper. Together with the title, the abstract must be adequate as an index to all the subjects treated in the paper, and will be used as a base for indexing. Variables should appear in italic text. Vectors should appear in bold italic text. Capital and lower-case letters should be distinguished clearly where there could be confusion. Fractional exponents should be used to avoid root signs. Extra symbols should be introduced to avoid complicated exponents or where it is necessary to repeat a complicated e_x_p_r+e_s_s_i_o_n a number of times. The slash (/) should be used wherever possible for fractions. Mathematical derivations that are easily found elsewhere in the literature should not be used. Notation must be legible, clear, compact, and consistent with standard usage. All unusual symbols whose identity may not be obvious, including subscript or superscript, must be made comprehensible. Physical and mathematical variables should be in italic, vectors in boldface. Units, abbreviations and special functions should be upright. Please add notes to explain any other special symbols. Figures should be original graphs (*.tif) with high contrast, suitable for immediate reproduction, typed on separate sheets and identified by its number. Width of an image should be sized to 6.5 cm for one column, 13.5 cm for full columns; and a maximum width is 15 cm for full page. In the figures, the main lines should be about 0.3 mm in width, and the assistant lines 0.15 mm. Notations in the figures should be distinct and consistent with the same ones in the text, and their font size will be 8-10 pt. Line drawings and graphs must have exported resolution of at least 1200 dpi. Photographs and micrographs must have resolution of at least 300 dpi (600 dpi if there is text or line art in the figure). Please use LZW compression. The positions of figures should be marked in the text by boxes of a suitable size. Each figure should have its own caption. Tables, numbered in order of appearance, should be appended on separate sheets and identified with appropriate titles. The table title, which should be brief, goes above the table. A detailed description of its contents or table footnotes should be given directly below the body of the table. F. Huang, N.R. Tao, L. Lu, Effects of Strain Rate and Deformation Temperature on Microstructures and Hardness in Plastically Deformed Pure Aluminum, J. Mater. Sci. Technol. 27 (2011) 1–7. G.R. Mettam, L.B. Adams, in: B.S. Jones, R.Z. Smith (Eds. ), Introduction to the Electronic Age, E-Publishing, Inc., New York, 1994, pp. 281–304. C.G. Bai, L. Murr, W. Smith, A Novel Method for Preparing Al Base MMC, US Patent, No. 200101133, 2001. K.L. Corwin, A Circularly-polarized Optical Dipole Trap and Other Developments in Laser Trapping of Atoms, Ph.D. Thesis, University of Colorado, 1999. H.R. Sheikh, Z. Wang, L. Cormack, A.C. Bovik, Live Image Quality Assessment Database Release 2, http://live.ece.utexas.edu/research/quality, September 8, 2006. Authors will receive a letter informing them whether the manuscript is accepted or rejected in three months. Authors should return their revised manuscript to editorial office within one month on receipt. When an article has been amended in compliance with the comments of referee(s), an electronic file of the final version should be sent with the revised manuscript. Proofs will be sent to the authors and should be returned preferably within 48 hours to avoid publication delays. As the manuscript has been accepted, all authors should transfer the copyright of the article, including that of the printing and on-line version, to the publisher. All authors must sign the Copyright Transfer Agreement before the article can be published. This transfer will ensure the widest possible dissemination of information.